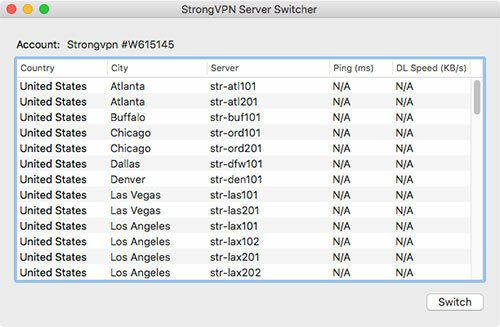 We reviewed StrongVPN a few months ago. Recently we noticed there have been a lot of changes to StrongVPN, including software updates, feature updates and pricing structure updates etc. Therefore, we decided to review StrongVPN again. 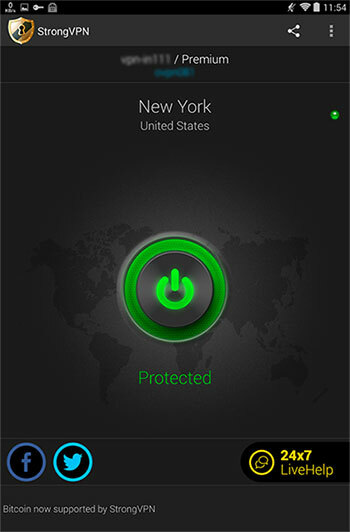 Below is our updated review for StrongVPN. Besides this Strong VPN review, we have also reviewed a number of other VPN services. If you are looking for a reliable VPN services to be used in China, Please also read our list of Best VPNs for China. Many VPN servers provide static IP addresses. StrongVPN is one of the most popular VPN providers with world-wide customers. It has VPN servers in 44 cities and 20 countries and supports all common VPN protocols. StrongVPN’s main domain, StrongVPN.com, is currently blocked in China. But you can access their service by using an alternative domain name: MyStrongVPN.com. After signing up a VPN account with StrongVPN, China users can download StrongVPN’s software and set up VPN on their devices. We confirm that based on our most recent tests, StrongVPN’s VPN service works fine from China. StrongVPN has over 450 VPN servers located in 44 cities and 20 countries, including United States, United Kingdoms, Canada, Hong Kong, Japan, Singapore, Czech Republic, Germany, Israel, Latvia, Luxembourg, Malaysia, Mexico, Netherlands, Norway, Romania, Russia, Sweden, Switzerland and Turkey etc. 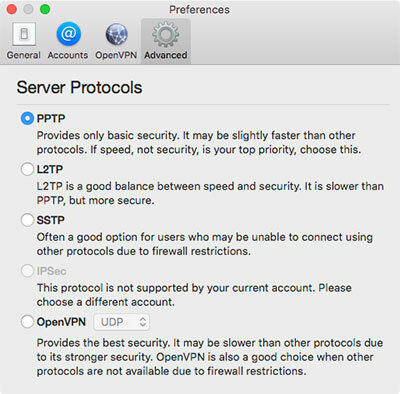 StrongVPN supports common VPN protocols including PPTP, L2TP, SSTP, OpenVPN and IPSec etc. StrongVPN has software for Windows, Mac, IOS, Android and compatible routers. It also provides instructions on manual VPN set up. StrongVPN allows unlimited bandwidth, unlimited traffic volume and unlimited server switches for all their VPN accounts. StrongVPN’s website has list of available servers for their customers. In this list, many servers has static IP addresses (as opposed to dynamic IP addresses, which might change every time you connect/disconnect your VPN). Static IP might be helpful for certain users. For example, some Internet gamers use VPN to play games that are only available to certain countries. With a dynamic IP, their accounts might be blocked, but a static IP will work better in this kind of situation. StrongVPN has a no-logging policy to protect users’ privacy. Unlike some VPN providers who has restrictions on P2P and file sharing, StrongVPN does allow P2P and file sharing. 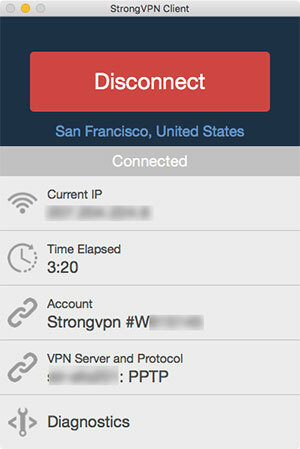 For simultaneous connections, StrongVPN allows users to connect to up to two devices at the same time. 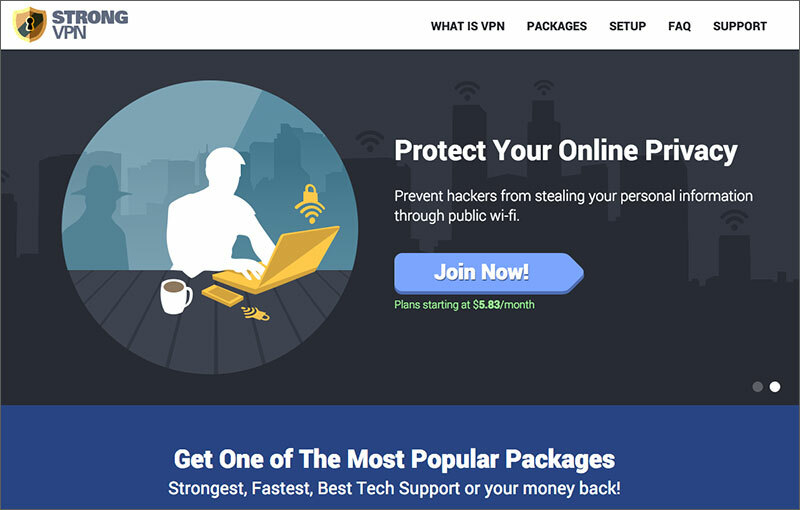 StrongVPN’s packages starts from $5.83/mo if you sign up for a whole year. If you would like to go month-to-month, the price will be $10 per month. Based on our understanding, there’re no differences in terms of features between their annual account and monthly account. 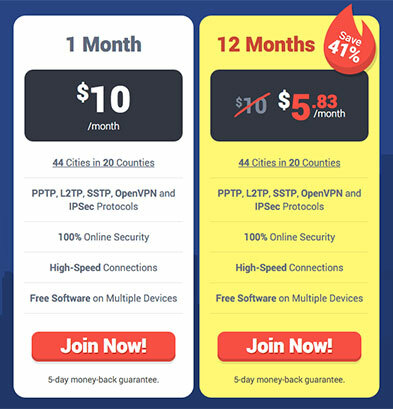 StrongVPN offers a 5-day money back guarantee for users to test out their account. StrongVPN provides software for many platforms, including Windows, Mac, IOS, Android etc. We downloaded their desktop client for Mac OS. The installation process was straight-forward and the software interface is clean. With the desktop software, you can connect/disconnect to VPN and also change servers and switch connection protocols (including PPTP, SSTP, L2TP and OpenVPN). To help users to make server selections, StrongVPN’s server switcher also allows users to test each servers for Ping and download speeds. When the StrongVPN client software is running, an icon will stay on the menu bar (or called system tray on Windows), and it will indicate whether you are currently connected or not. StrongVPN has their own iOS app, which can be used for iPhone, iPad and iPod Touch. 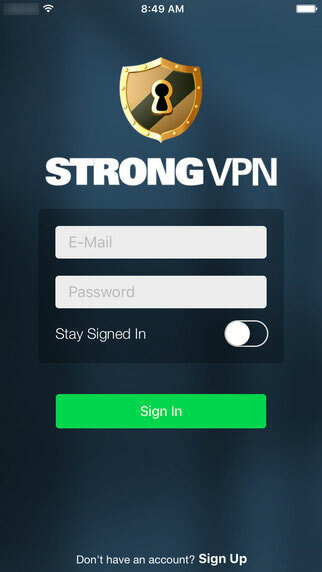 Users can search for “StrongVPN” in the app store to find and install this app for free. StrongVPN also has their own Android app, which can be used for Android phone or Android tablets. Users can search for “StrongVPN” in the Google Play Store to find and install this app for free. Note that StrongVPN’s Android App only supports the OpenVPN protocol. If you want to use the PPTP or L2TP protocol on an Android device, you must set up Strong VPN manually. The instruction can be found on StrongVPN’s website. Then we used StrongVPN’s Mac desktop client to connect to their U.S. server in San Francisco using the PPTP protocol. We got a download speed of 18Mb/s, which is a very fast speed. On StrongVPN’s website, there’s a link to their Support Area, where users and visitors can submit questions/requests etc. using their online form. StrongVPN has agents available through their help desk 24x7x365 to assist with their customers. However, there’s no live chat support available. StrongVPN is one of the big VPN providers. Its VPN connection is quite stable and its speed is very fast. Based on our tests, we found StrongVPN works very well in China. In addition, StrongVPN’s recent changes to their software and features makes it a much better choice than before. If you’re looking for a good VPN for China, you can give StrongVPN a try. This entry was posted in VPN Reviews and tagged review, StrongVPN. Bookmark the permalink.